Play OJO - Read this review before registering! 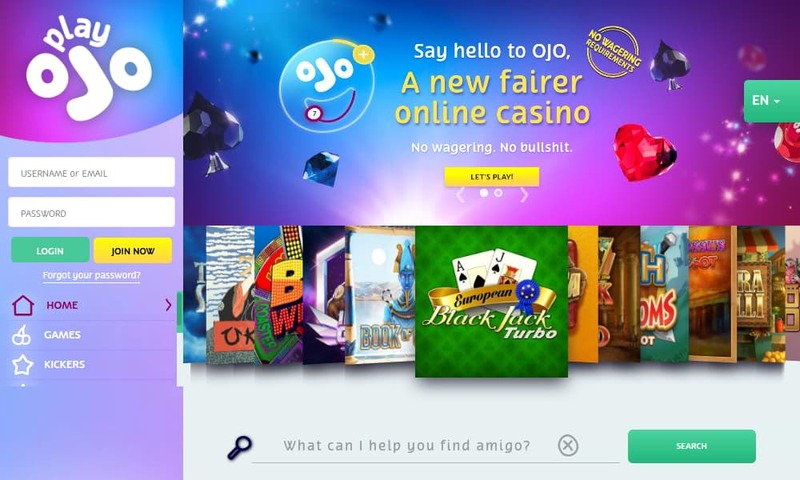 PlayOJO is a relatively young online casino that was only established in 2017. However, they left a great impression with the players, as they offer some of the best games available on the Internet, as well as a very interesting reward program that imposes no wagering requirements. You can find the games from many different developers, among them Netent, SkillOnNet, Merkur, Microgaming and Amaya. The casino currently offers over 500 casino games that you can play on desktop also a large selection of games available for mobile devices. PlayOJO features the games for many developers, such as Microgaming, Netent, Merkur, Amaya, WMS, Barcrest, SkillOnNet, Blueprint Gaming, NextGen Gaming, GVG, 2By2, Bally, Aristocrat, ShuffleMaster and Lightning Box. There are over 500 games available that you can play directly in your browser without having to download a casino software. The games are neatly categorised on the website, and you can select from slots, roulette, blackjack and other categories, and you can also sort the games by different features. The slot selection includes popular slot machines, such as Zeus III, Drive Multiplier Mayhem, Flip Flap, Wild Crystal Arrows, Gonzo's Quest, Mega Fortune, Wish Upon a Jackpot, Mega Joker, Twin Spin, Hot Wheels, Mega Moolah, and many more. Many of the games also have progressive jackpot, you can try your luck at becoming a millionaire. The selection also includes classic casino games, such as roulette, blackjack, video poker in different versions and a live casino where you can play against real dealers in an authentic casino environment. What makes this casino special is that they have no wagering requirements or bonuses that are tied to strict conditions. The casino aims to be as transparent as possible when it comes to their terms, but it is a little different from other casinos, and you need to make yourself familiar with how the reward program works. The casino does not offer deposit bonuses as such, but when you play the games you will be rewarded with cash money that you can either pay out or put into play again. As a new player you can get a welcome bonus of up to 50 free spins. You can get 1 free spin for every £1 you deposit, up to a total of 50 free spins. The winnings from these free spins are paid out as cash that is not tied to wagering conditions. The special feature of the casino is the OJO Wheel. This is the reward program of the casino, and you will be rewarded when you play the games. You will basically collect OJOplus money when playing the games, regardless of whether you win or lose. Some games pay back more than other games, you can find the complete list on the website. PlayOJO Casino is operated with a casino licence from the Malta Gaming Authority, as well as the UK Gambling Commission. The casino mainly targets the UK market, but also accepts players from many other countries. The casino has so far proven their trustworthiness, and the regulatory bodies ensure that they are regularly audited for compliance, and that player funds are protected. The website is also secured through SSL encryption, and you can perform safe transactions. The casino is also very strict about confidentiality, and they will not give out your personal data to third parties. You have several methods available for deposits and withdrawals, among them credit card, e-wallets and voucher payments. The minimum deposit is £/€/$ 10, and the minimum withdrawal is £/€/$ 20. The withdrawal limit is £/€/$ 10,000 per transaction. Some of these methods may incur a small fee as well. A bank transfer withdrawal incurs a fee of €10, but other methods are free of charge. The withdrawals are usually processed on the same day, provided that the player account has been verified. The verification is a normal due diligence procedure of the casino to avoid money-laundering or fraud. Depending on the chosen withdrawal method it can take between 1 and 5 days before the money appears in your account. The customer support of PlayOJO Casino can be contacted through the live chat on the website, e-mail or phone. For support is available 24 hours and the live chat from 06:00 - 00:00 GMT. PlayOJO casino offers a new approach, especially with regards to casino bonuses. The Casino pays out real cash rewards when you play there, and you don't have too worry about bonus money or bonus conditions, as they simply do not exist. The game selection is also fantastic, and you can find hundreds of different games that can be easily sorted on the website. Everyone should find their favourite game here. Overall, the casino has a lot to offer, and it is a website that you should definitely take a look at. add_circle The deposit bonuses (when they worked) and the no wager requirements on your winnings. That is one of the best I know. remove_circle Have been a loyal customer for almost 2 years with Ojo, never really had a problem with them, withdraw time is one of the Longest out of any online casino I have used. My reason for the 1 star is after depositing £100 to get 25 free super spins last Monday, they quit happily took my money in seconds as usual but I never received my free spins. Contacted the last online support to be told I had deposited 3 times that day and can only claim the bonus once per day. I did and can only afford to make 1 deposit like this once in awhile I was very surprised to hear them say that, but surely they can see in my account if I had received the free spins or not??! After waiting almost an hour to talk to some one one the online chat I was then put through about 30 mins of the “copy and pasted” responses that really make you feel like a special customer (looking at the time logs you can see Ojo have a policy of message at least very 2 mins to make the customer think you care. Standard rubbish like “thank you for your patience, i am looking into this matter for you”, 2 mins late, “I am looking into this for you”, 2mins later, “I will be right with you”, this goes on in various forms for a very very long time, then once you actually get a human (you can tell because the spelling and how unprofessional the wording then becomes). So by the time I had finished with the agent on the chat, she could see I hadn’t received the free spins I should have got, she could only offer me feee spins at half the value of the initial bonus. Out of principle I kindly refused and advised that the only reason I deposited that much was due to the bonus that was being offered. I advised the agent that I will withdraw my deposit and come back another day. We wished each other farewell and I requested a withdrawal of my deposit I had down 2 hours previous and had not spent any of it because it says in their terms and conditions not to if you have a problem with a bonus to do with a deposit. Since that day Ojo keep refusing my deposit of £100 and when I send them an email or try and get in contact to ask what the reason is, there is no response at all and not a single care is given to the customer when they have a genuine issue. I work in customer sevice and what I have experienced here is that Ojo are a company very happy and quick to take your money but do not give you an ounce of respect as a customer and is impossible to get a response from them through the methods of contact they advise on their site. Loyalty counts for nothing with these guys. To sum it up, I have played weekly on Ojo for almost 2 years. I deposit £100 for the bonus attached. Didn’t receive the bonus but Ojo took my £100. Online support crew couldnt give me the bonus. Didn’t spend any of my deposit. Tried to withdraw my deposit. It has been refused every day now for a week with no explanation, I have tried to contact them in many ways with no luck, 5 emails sent asking why they will not let me have my money back but nothing. Funny how today I have 2 promotional emails from them trying to get me to deposit for a bonus. Good company until they are not. All of the sudden I can’t withdrwa my money I just deposited and they won’t tell me why. Next step, trading standards with my screen shots and bank statements. Sorry Ojo but you made me do this. I didn’t want to do this review but gave Ojo very opportunity to respond to me for over a week now and all I have had is promotional emails trying to get me to deposit more.